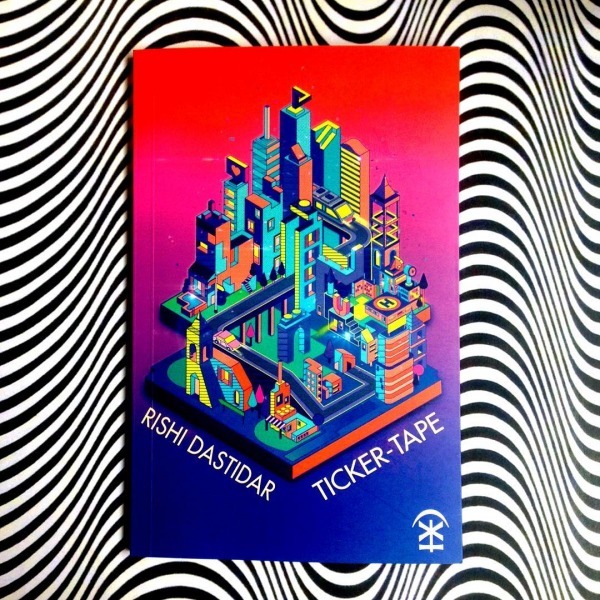 Reading Rishi Dastidar’s Ticker-tape (Nine Arches Press) gives essential insight into what it is to be alive in Britain today. Dastidar’s debut full length collection marries project management and social media, politics with good old fashioned unrequited love, and clearly shows a fresh, original and important voice. The deceptive simplicity of the repetition at the start of each line gives a canvas sufficiently open for Dastidar to fling the beautifully tainted paint of late capitalism at. This topicality reverberates throughout Ticker-tape, especially in ‘On Enthusiasm’, where Google fails to ‘name a year / in which nothing happened’, telling him instead ‘all about / the apocalypse that didn’t arrive / in 2012’. In ‘Gunmetal’, the sky is likened to ‘Mussolini’s mistress’s dentures / in a Waterford tumbler’ and ‘a Tao Lin Google Chat endlessly referring to its/ own digital circularity. ‘Bantz’ introduces the hashtag to modern poetry, playing two columns of youthful energy and decadence down both sides of the page to the shared conclusion ‘THIS BANTZ IS FOR THE PURPOSE / OF HUMOUR AND SHOULD NOT / BE TAKEN SERIOUSLY’. “I tell you it’s a seagull”. to neuter my Gatling gun tongue. ravaged like Northumberland in 865. By framing it as an address to a fellow artist, Dastidar opens the beginning of the poem up into an exploration of artistic processes. The meat and middle of the poem haul the familiar landscape of courtship through environmental catastrophe and millennia of European warfare. The last four lines capture the essence of good love poetry, combining thrill, expectation and disappointment to great effect. the only safe space is empty space. It is a very political poem – the playful imagery of ‘Big Rock Candy Mountain’ and ‘PornTube wrist’, the orgiastic frolicking jar against the devastating impact of the drones ‘making confetti out of wedding favours’ – of which the collection boasts an embarrassment of riches. The seven blistering pages of poetry which make up ‘Pretanic (A journal of some proceedings on the North Atlantic archipelago)’ explicitly address the recent political climate in the British Isles. For a world which can be as slow moving as poetry (mea maxima culpa) the recent pace of ‘developments’ in the political sphere can leave us flat-footed and out of date. Both Dastidar and Nine Arches do a great service through poems like ‘What’s the matter with [insert (non-metropolitan) English constituency of choice]?’ in which he cleverly combines an accomplished sonnet with a heartfelt rant about what the political left needs to do and what it needs to stop doing. The daring shown in his choice of subject matter is paralleled in his experimentation with the shape and form of his poetry, such as in ‘A man is on the TV, telling me about’. In this prose poem we learn a lot about the man doing the telling, but the subject of the telling is blacked out, as if in a redacted document. At the beginning of the piece, this great teller is ‘A man who is urbane, a realist, a man who knows, is on the TV telling me about’. Through the piece, Dastidar exposes the frailties of this modern day messenger’s character – ‘A man who slavishly chases proximity to power is on the TV, telling me about’ ‘A man who thinks he is the new TE Lawrence is on the TV, telling me about’ ‘A man who has never been the other is on the TV, telling me about’ until ‘A man who has misplaced the knowledge that he is human is on the TV, telling me about’. No review of this collection would be complete without some mention of ‘Ticker-tape’, the title poem. It really is a masterpiece. After a six line preliminary, two hundred and ten lines of Rishi Dastidar’s uninhibited imagination are unleashed on the reader. Just about everything else that I have spoken about in this review is contained in the sustained intensity of the piece. All the lurid and banal details are on display here, all the topicality, all the timelessness. At the level of poem and at the level of collection, Ticker-tape is a phenomenon. For the author, it is the culmination of several years patient craft building. It shows skill and courage in equal measure. For the reader, the poems are expansive and at times percussive, energetically coming at their subject matter from all angles like a classic All Blacks rugby team. I’ll leave the last word to the maestro himself, with a poem of yearning which keeps drawing me back, and yields a little more each time I come to it. over triumphant Hanseatic business deals. “Sir, there’s another connection in 45 minutes. Why not let Schiphol be your home for now? You can buy Ticker-tape from the Nine Arches website.